Total ozone in polar regions is measured by well-calibrated satellite instruments. Shown here is a comparison of average springtime total ozone values found between 1970 and 1982 (solid and dashed red lines) with those in later years. Each point represents a monthly average in October in the Antarctic or in March in the Arctic. After 1982, significant ozone depletion is found in most years in the Arctic and all years in the Antarctic. The largest average depletions have occurred in the Antarctic since 1990. 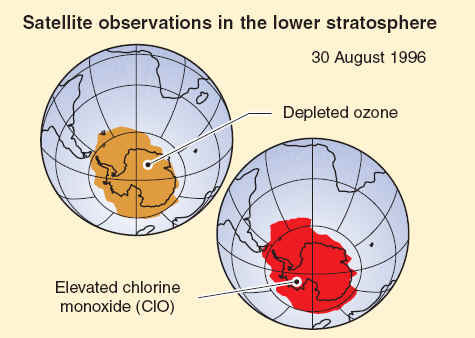 The ozone changes are the combination of chemical destruction and natural variations. Variations in meteorological conditions influence the year-to-year changes in depletion, particularly in the Arctic. Essentially all of the decrease in the Antarctic and usually most of the decrease in the Arctic each year are attributable to chemical destruction by reactive halogen gases. Average total ozone values over the Arctic are naturally larger at the beginning of each winter season because more ozone is transported poleward each season in the Northern Hemisphere than in the Southern Hemisphere. The stratospheric ozone layer resides between about 10 and 50 kilometers (6 to 31 miles) above Earth’s surface over the globe. Long-term observations of the ozone layer with balloonborne instruments allow the winter Antarctic and Arctic regions to be compared. In the Antarctic at the South Pole, halogen gases have destroyed ozone in the ozone layer beginning in the 1980s. 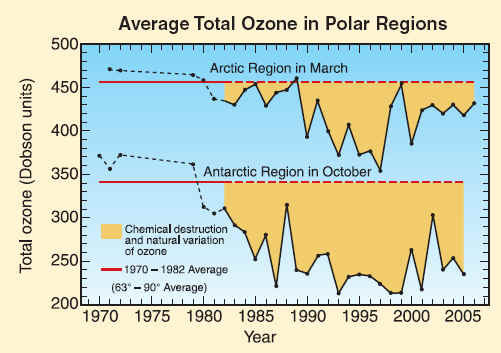 Before that period, the ozone layer was clearly present, as shown here using average ozone values from balloon observations made between 1962 and 1971. 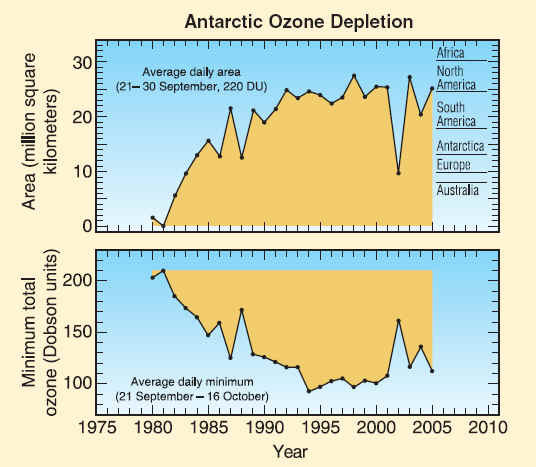 In more recent years, as shown here for 2 October 2001, ozone is destroyed completely between 14 and 20 kilometers (8 to 12 miles) in the Antarctic in spring. Average October values in the ozone layer now are reduced by 90% from pre-1980 values. The Arctic ozone layer is still present in spring as shown by the average March profile obtained over Finland between 1988 and 1997. However, March Arctic ozone values in some years are often below normal average values as shown here for 30 March 1996. In such years, winter minimum temperatures are generally below PSC formation temperatures for long periods. Ozone abundances are shown here with the unit “milli-Pascals” (mPa), which is a measure of absolute pressure (100 million mPa = atmospheric sea-level pressure). Satellite instruments monitor ozone and reactive chlorine gases in the global stratosphere. 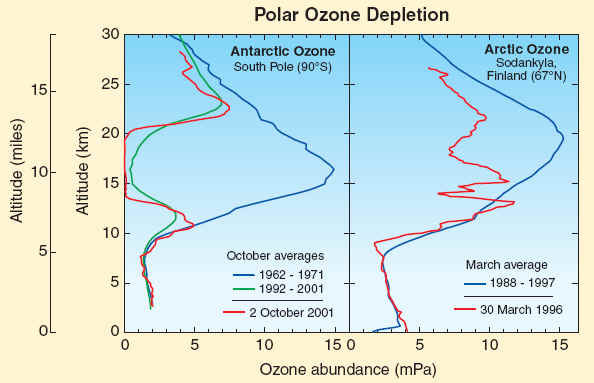 Results are shown here for Antarctic winter for a narrow altitude region within the ozone layer. In winter, chlorine monoxide (ClO) reaches high values (1500 parts per trillion) in the ozone layer, much higher than observed anywhere else in the stratosphere because ClO is produced by reactions on polar stratospheric clouds. These high ClO values in the lower stratosphere last for 1 to 2 months, cover an area that at times exceeds that of the Antarctic continent, and efficiently destroy ozone in sunlit regions in late winter/early spring. Ozone values measured simultaneously within the ozone layer show very depleted values.